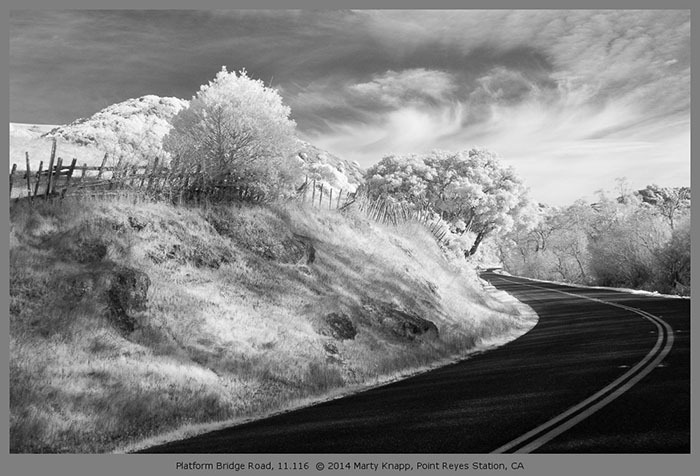 Our sincere thanks go to this month's featured guest photographer, Marty Knapp! We truly appreciate the time he took to answer our questions, and to share some of his stunning fine art with all of us! Please visit his links to see more of his inspiring work, and to let him know you enjoyed this interview. :: In the short film about you, you said you got your first camera when you were young and it captivated you immediately. What was it about the camera and photography that drew you in? Also, you lost that first camera, and I assume took a break from photography. How did you find your way back? How I feel when I make photographs today harkens back to that moment when I held my first camera. I wrote about these events in my book, Point Reyes 20 Years. I was captivated by that first camera, given to me as a present by my grandfather when I was eleven. As soon as I held it I thought it was the most magical wonderful thing I had ever touched. The aromatic leather case, lined with velvet offered more delights inside. When opened, the gleam of the curved glass lens, and well, those arcane numbers encircling the lens and inscribed on the control dials fascinated me. That first time, and whenever I used it afterward, I felt happy, a wholeness that continues today when I pick up my current cameras. It's why I became a photographer. Yes, the first camera did go missing when I became an adolescent and other interests distracted me. In high school, sports and other romantic adventures captured my fancy. Even in college, I never touched a camera. I forgot who I was supposed to be . . . what I was destined to do. Then one day in the early 70s, my lifelong friend, Jerry, visited me in San Francisco. I was 25 years old. I had seen a friend's 35mm SLR, and was captivated by it. Jerry took me to the Presidio PX, where I bought my first professional camera. As I picked it up and examined it, a flood of memories filled me. I can't tell you how excited I became. As I held my new camera, I knew that this is what I always wanted to do...make photographs. How could I have forgotten this for so long? The rest of my career in photography had its ups and downs, but I was with my camera again, continuously to the present time. :: Was it always landscape, or did you go through periods where other subjects dominated your work? The landscape always appealed to me, even before I was a photographer. But, when I began using cameras in the early 1970s, I mostly photographed my friends and family. I lived in San Francisco at the time and just enjoyed shooting in an undisciplined, casual kind of way, documenting what was right in front of me. Later, after moving to Point Reyes, I awakened to the natural beauty that surrounded me in my new home. Even then, though I went through a number of changes as I gradually tried to eke out a living via my photography. In 1975, while working my day job, I started a side business making home portraits of children & families. I barely made enough to offset my printing costs, forget about the equipment costs! I ran ads in the local paper and since I had my own darkroom, I offered various photography services: portraits, products, artwork, copying of old photos, custom film developing and printing, even some matting and framing. None of this involved the production and selling of my own artwork. That was to come later. 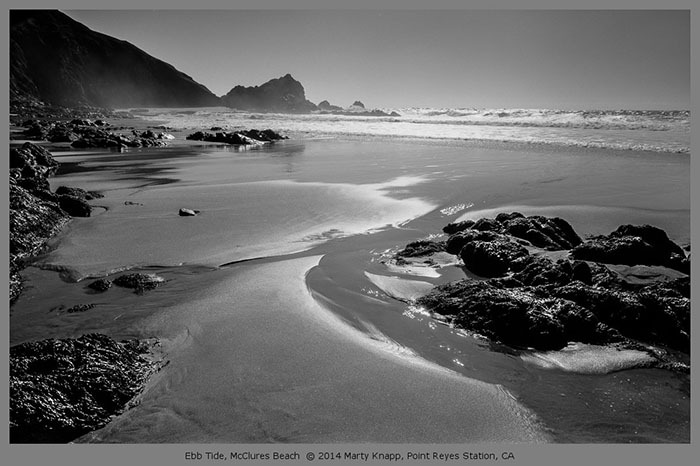 By 1986, inspired by the beauty I found in Ansel Adams black and white photographs, I began documenting the landscape at Point Reyes. A few prints sold early which inspired more effort and eventually I thought I could support myself with my art and so I quit my day job. 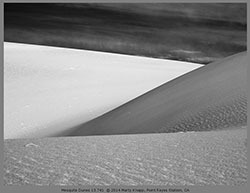 By then, I had narrowed my photography business to two pursuits: critical color copying of paintings and art objects and the production of my own black and white landscape photographs as fine art. I felt confident that somehow I would eventually succeed at my plan, so I got the materials and equipment I needed to upgrade my creative landscape work. :: You moved to Point Reyes in 1973, and it seems from there landscapes and that region have been your primary subjects. What is it about that area that keeps you coming back to shoot it? What challenges you these days after photographing the same area for nearly 40 years? 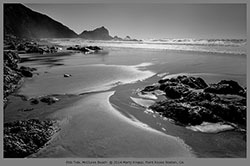 As beautiful as the rugged wilderness of Point Reyes is, there are times when I fail to be inspired to photograph there. The fact that I live at Point Reyes means it's easier for me to access the natural beauty. Even so, it can feel like, well I've been there, done that. Making a trip to the Southwest or the California desert can re-awaken my muse. Looking closer, shying away from the grand landscape is another refreshingly creative exercise. Macro photography of dewdrops or frost on the local vegetation, or of liquids in containers on my studio table also stimulates me. I can work on studio macro photography no matter what kind of light is happening outside. I get to make my own light. This freedom to create at any hour has been very liberating. Lately, I've been re-visiting the landscape here via my infrared-converted camera. It's incredible to see how dramatically different things look when recorded in this non-visible light. :: What other locations do you enjoy working with, and what areas are you excited about photographing some day? I have this big thing for rocks, so the Alabama Hills have called to me many times. The eastern side of the Sierras from Mono Lake down to Lone Pine is probably my favorite away-from-Point-Reyes-location. I never tire of photographing the dunes in Death Valley. The landscape in Eastern Oregon and Washington intrigue me, or maybe I'd like to explore the Mojave Desert. :: You mention in your bio you work now with digital and film cameras. Does anything in particular draw you to use one format over the other? What drawbacks do you think digital has that the film cameras and format did not (and vice versa)? It's been over 3 years since I made a film exposure, so I'm afraid my film cameras are relegated to a "history of my tools" shelf in the studio. I can't seem to part with them as they've brought me so many of my cherished images. And, just in case, I have 30 rolls of 120 B&W film in my freezer. However, my darkroom has been taken down and disbursed to various other photographers and schools. I think there's still an advantage working from a high-level digital scan of a larger piece of film, either 120 or 4x5, over what you get from straight digital capture. However, I think that advantage has been shrinking and is not so huge as it used to be There are so many reasons I prefer using digital cameras, not the least of which is that I now get to see the black and white scene, instead of trying to pre-visualize it. I use Panasonic and Sony mirrorless cameras which enable me to preview the scene and the focus through the viewfinder before I make the exposure. The one drawback to digital that comes to mind is that since it is so easy to make reasonably good, well-focussed exposures, it's easy to become lazy, not spending the time to consider the composition. When shooting on film, I counted out exposures and tried to make each count, because I could run out of film before the good light came. Of course the down side in shooting film would be getting too conservative and passing up the best shot of the day because I needed to save film for something better. :: When it comes to processing, are you working both in the digital and traditional wet darkrooms? Or do you scan the negatives and work with them digitally? What has been the biggest changes or challenges from converting to the darkroom to the computer? Do you prefer one over the other? No more wet darkroom. I work from both scanned negatives and digital files captured by camera. Lightroom has replaced my darkroom. Switching from wet darkroom analog photography to digital was daunting. I had to learn a whole new technology. :: What are the biggest changes you’ve seen with where photography (specifically landscape photography) has come over the past 25-40 years? What changes are most exciting to you as a photographer, and what downfalls has all the new technology brought with it? Since almost everyone has a camera and can make reasonably well-exposed and focused images there is a glut of bad photography out there masquerading as art. We are saturated with numbers of images in orders of magnitude greater than at any time in the pre-digital photo era. It's just overwhelming... folks racing around with their digital cameras "getting" their own version of Ansel's or someone's famous landscapes. The National parks have obliged these crowds by putting marker signs up for all the best photo opps so folks don't even have to think about it. On the other hand, now that we have the digital advantage, we are freed up to truly see. Just because we can take a thousand photos a day, doesn't mean we should. The time we used to spend fretting over our exposure and focus is now freed up for truly creative responses to what we see. :: How has social media been incorporated into your photography business now? I've been resistant to social media so far and don't use it in my business. I do maintain my own website, blog and email newsletter, which goes out to a few thousand people who know me and my work. I don't have a smart phone, just the most minimal cell phone that Sanyo makes. I like being connected, but face to face with my favorite beings - my wife, dog, cat and a few dear friends and family members. :: What is your favorite piece of non-photographic gear? I have an Ipod Touch in which I keep my calendar, address book and audio files that I listen to with earbuds before sleeping every night. :: What are one or two scary things that have happened to you on your journeys with the camera? There's a local trail that goes to a splendid overlook of Mount Tamalpais. One particular summer evening as I walked down from the ridge back to my car I passed through an overgrown section. The trail was carved through a steep, brush-covered hillside, rising abruptly to my right and falling off precipitously on my left. Without warning, or any sound to alert me, I felt the the hairs on the back of my neck rise and a chill run through my body. I looked around but could see nothing in any direction. I sensed that a large animal, a cougar, was watching me. I picked up a rock in one hand and held my tripod over my head, trying to look as big as possible. I was truly prepared to do battle if necessary. I walked briskly down the final half mile without incident, but the next day read in the local paper that several people had sighted a large mountain lion in the vicinity of my walk. :: What piece of advice would you pass on to newer photographers, or those looking to make a career out of fine art photography? I've said this at schools where I've been asked to speak with art students, photographers: Unless you're prepared to lead a fairly solitary life, dedicated to your craft and are willing to forgo economic security, I suggest you get a real job that can support you as you test the waters with your art pursuit. While you're young, devote all your spare time to honing your skills. Be resilient and willing to take criticism without becoming discouraged. In fact, if you can become grateful for criticism, you're on the right path. If your real job allows you to access your photography pursuit either on the job or by giving you enough time free to pursue it, then you're at the right job. If, like me, you're burning with the desire to be better and love using cameras, then that's another clue that you just might make it. In all events, make sure you know what you're getting into and how long the odds are that you'll make it. There are many folks with cameras but very few will become fine art photographers. :: What was the best piece of advice you received as a beginning photographer? Learn everything you can about how your camera works and what effects you'll get by adjusting its various controls. Then practice these adjustments until you know them blind, without thinking. Thus, when that momentous event or display of great light appears, you will be prepared to capture it. Louis Pasteur said it better, "Chance favors the prepared mind." I don't know if this is the best advice, but it has served me well. :: In the movie short about you, you mentioned a period of time where you were living the wild life, and photography took a back seat. What is it about the medium that caused you to turn away from that lifestyle and get back behind the camera, and how did that kind of lifestyle help you through those periods where you maxed the credit cards buying every lens and camera? Although it isn't clear from the movie because everything is so distilled into a few precious moments, there really were two aspects to my becoming successful at photography. They were separate issues and were resolved one at a time. The first was a recovery from alcohol addiction. This is probably the hardest thing to articulate. During my "wild time," I still photographed, but I had no goals with my photography. Still, though, my lens was capturing the beauty of light and I would see that light and notice it every once in a while. I didn't pay a lot of attention to those crystal clear moments, because I was in such a fog much of the time. I sensed that I needed to do something about this fog. My thought was, "I'll quit drinking when the time is right." One morning I woke up in a kind of heightened, altered awareness. I had an epiphany and it was so clear that I was finally through with my substance-abusing lifestyle. Now you can call it what you like, but I believe I was being filled with the spirit of God. I didn't have a vision, it was more a feeling, a profoundly clear moment. I knew then that I was through. Done, simple. I was filled with an immense happiness and a sense of gratitude and relief. I remember saying in my head, "I will become a photographer and from now on I'm moving towards the light." That's when I truly decided to become a photographer and I've never turned back. All the energy and time I had spent on partying now was diverted into finding and making beautiful photographs. The second part of my becoming successful was getting practical about money. Since I had a stack of credit cards, it seemed obvious that I didn't have to wait to get my photo paper, camera lenses, film and other tools to pursue my life's passion. So, once clean and sober, I spent nearly every waking moment honing my skills and buying the gear I needed to become the photographer that was blossoming inside me. I kept my day job for a while and then along about 1990, quit that and lived in a tiny studio where I converted a small bedroom to a darkroom and slept on a futon in the loft above it. A gallery on the main street in Point Reyes had some great early success selling my work, and a series of miniatures I produced were selling well at a number of Bay area arts/crafts/decor type shops. I made enough to keep going, but I was slipping into some serious debt. The sales of my work lagged well behind the expenses I had taken on. In 1993, after living alone for 10 years I re-married. My second wife, Jean, did not know how deeply I was in debt when she married me. When I confessed to her the state of my financial situation, she wondered why I'd let things go so far. I told her that I wasn't concerned as I believed I would soon make enough money as a photographer to get out of debt and be successful. I had this optimistic faith in my work. In 2001 I opened my own gallery on the main street of Point Reyes Station. Although it took much longer than I expected, we eventually righted our ship. My redemption mostly relied on my dogged determination and nearly blind confidence that things would eventually sort out. I've always been drawn to the way the angle of light describes an object. When things are cross-lit or back-lit, the subject gains the dimensionality needed for representing it in the 2-dimensional world of the photographic image or print. It surprises and delights me how, when color is removed from one of these evocatively-lit scenes, you start to notice other things about the design of the composition. Sometimes when I demonstrate this by "turning off" the color on the screen during a digital review, I hear audible murmurings coming from the group watching the display. Shapes, lines, patterns and textures that weren't noticed literally jump off the screen. I never work with color outside of using it to adjust the contrast and tones behind the scene as I convert my raw images to black and white. I love color in paintings, but since I already see the world in color I'm not interested in expressing it in my work. Abstracting what lies under the color, just the light reflecting from and defining the scene, captures my interest and ignites my passion for the beauty of light. By the way, although I like to remove the color clothing from the scenes I photograph, I generally keep my own clothes on at work! :: What is on your photographic bucket list in the next 5-10 years in terms of projects, etc., where others can see your work? I'm beginning to explore the macro world more and more these days and plan to continue that work. I love the surprises I find when looking very closely at light and form through my magnifying lenses. Abstract imagery increasingly attracts me. Also high on my list is working in the Southwest with more traditional landscapes and also infrared imagery. 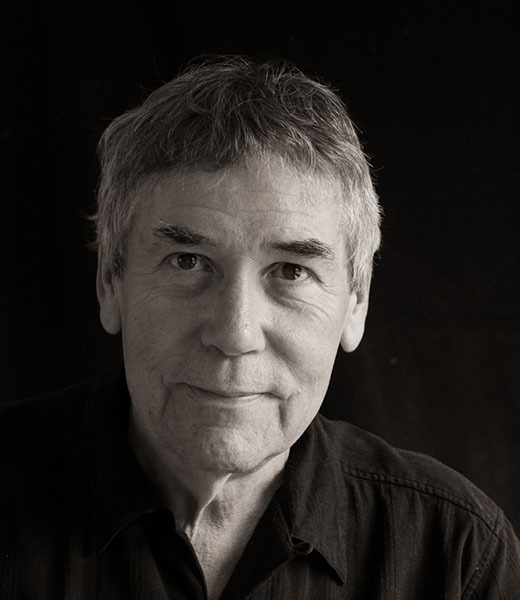 I also enjoy writing about my experiences and thoughts about making photographs, which I do in my blog, Lumengraphics. There just might be another book on my bucket list. "I love the surprises I find when looking very closely at light and form through my magnifying lenses."